My old blog has served me for a long time and the Blogger platform was relatively simple, free and it has always "just worked", mostly. The old blog looked a bit dated. There were a few issues with the old blog as well, the library I used for Code Formatting was a major version behind, the theme and layout engine was very hard to tame, I let my tags become a mess over the years and many of my page urls were far from Search Engine friendly. I wanted my migration to support for most of those things. Initially I tried Hugo and Jekyll. But the whole Python|Ruby|Node on Windows is still just a mess. The migration tools wouldn't work and relied on the old ATOM+RSS feed from Blogger which was ham-stringed by Google over time. The migration tools were all written in languages I do not master fully. We're using Wordpress at Xpirit to host our website and I always get lost in all the control panel options, fields and tabs. Then I found Ghost Pro. The hosted version of Ghost. 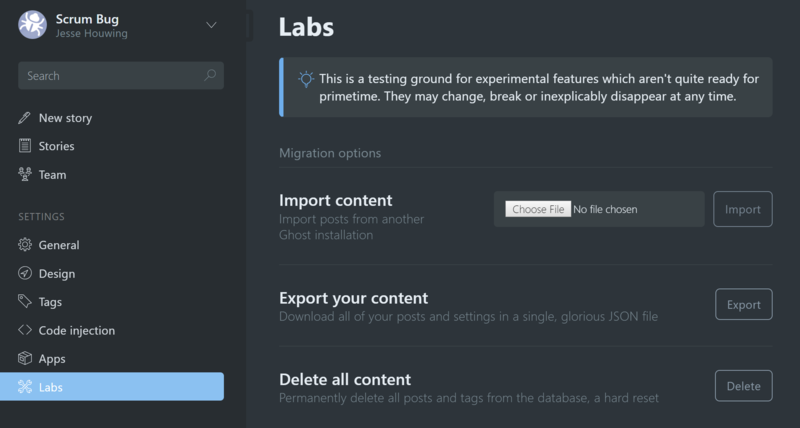 It's simple, looks great and offered a powerful import/export module which gives full control over the content you're bringing into the platform. 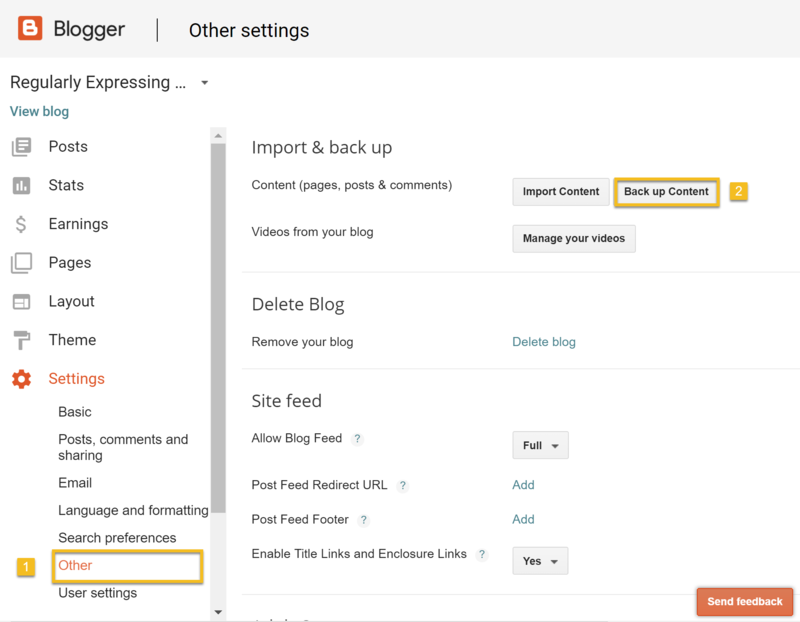 There was even an existing Import/Export tool for Blogger. So I decided to give it a try. First thing I did was setup a trial account and playing around. I manually copied over a few blog posts, and tried out a few things to see if I could get my Google+ comments to move over, add it to Google analytics and such. I didn't bump into any major issues. Then I exported my test site to analyze the structure of the export file to weigh my options. Next step was to try the existing Migration tool which was written in Node. A very, very old version of Node. Unfortunately I couldn't get the migration tool to play nice and while it did migrate over some of the content, it butchered most of it. So I took a brave step... I decided to build my own migration tool: Blogger2Ghost.NET. Written in C#, my most comfortable language. This step of course took a bit of time, but it also gave me full control over the migration process. The first thing I needed for the migration was a reliable method to get my data out. Step one was to get the RAW page contents. 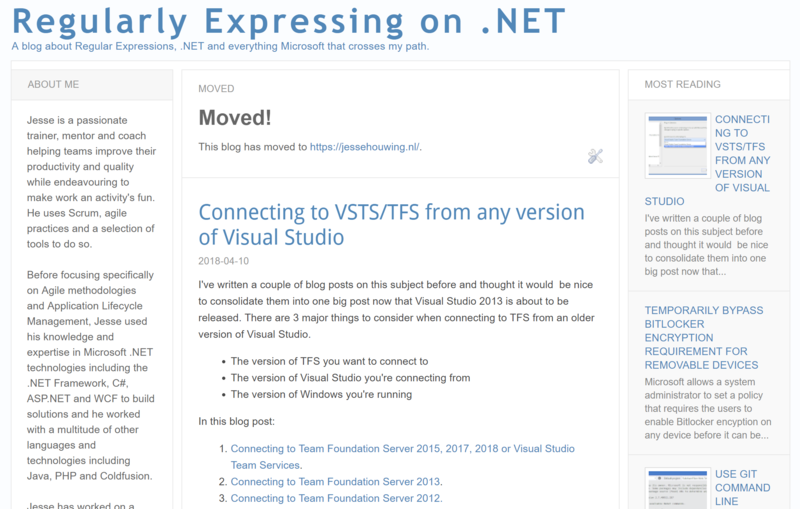 Luckily Blogger has added a "Export Data" option which gives you a file with the full XML contents of the blog. Use the Back up Content option to get your data out. This provided a great place to start. The next step was to parse all the HTML content to grab the Image URLs, which - with the help of the HTML Agility Pack, was a breeze as well. I created a simple command line tool to host the migration. This parses the blogger backup file and finds all the image urls. Then downloads them to a single images subfolder. At this stage I found out that I had quite a few broken image links in old blog posts. The migration tools provides a list of broken images, but of course these will have to be fixed manually. Later I found out that the <img> tag for a blogger hosted image links to a thumbnailed version of the image. A bit of extra code also grabs the larger image which can be found in the enclosing <a> tag. Image mappings. Based on the previously downloaded images it contains a list of all the original blogger image urls and the relative url to the Ghost blog root. Url mappings. It contains a list of all the urls on blogger and their target slug on Ghost. 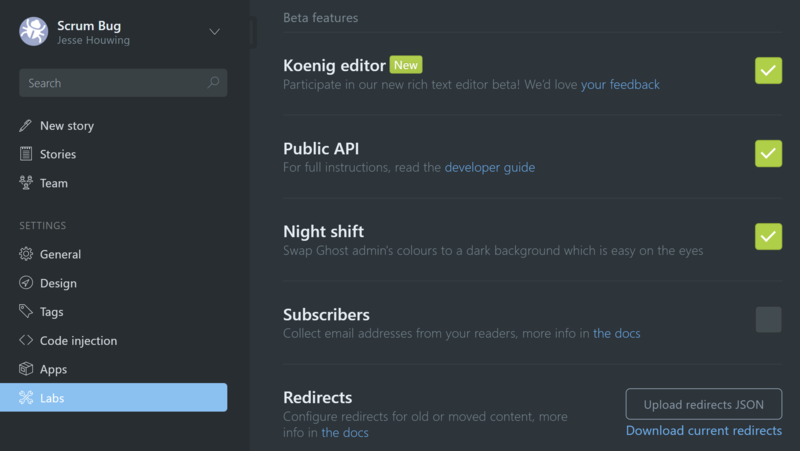 This will later be used to change post urls, consolidate pages and a few other things. User mappings. In order to map the Blogger author(s) to Ghost users. Tag mappings. Blogger has a fewer restrictions on tags, so in order to import the blog I had to rename a few. I also use this file to delete and consolidate some tags. In the authors.json add your to_email and slug. If your admin user is blog author (which is the case for me), make sure the data matches the existing user data. Other users will be created on import. In the tags.json you'll be able to set the target slug and consolidate the tags in blogger through the blogger_tag list. You'll need to duplicate that to aliases unfortunately due to some incomplete refactoring. To remove a tag completely, simply remove it from the tags.json. To influence the order in which tags are assigned, change the value of order. Higher numbers will be assigned to posts first on import. Ghost supports parent/child tags on import, though I haven't found a reliable way to change this later. The urls.json file is used to map the blogger urls to their new location on Ghost. This file is also used to fix internal links between pages on your blog (Blogger by default always uses absolute urls for everything. The final mapping file is not generated as part of the preparation stage but is generated as part of the conversion. I'll discuss the redirects.json later. If you want to make sure your images are similar in size or smaller than a certain dimension, this is the right time to do that. I did not build this as a feature of the migration tool, but it's pretty straightforward to use an image editing tool to resize your images on disk. There are even a number of free bulk-conversion tools available. I used Adobe Photoshop's batch processing feature to reduce the size of my images. Just save the images in-place and they'll be the ones that are imported into Ghost. If you want to keep your Google+ comments copy post.hbs to custom-blogger.hbs and add --template blogger to the command below. The convert command may find a few issues (such as misspelled tags, missing authors, etc) so you may need to go back to fix your mapping files. Once it generates a zip file successfully it's time to import it into Ghost to see what it looks like. It took me a few rounds and a couple of manual tweaks to get to a reasonable result. There are still a few things that get lost in the migration though. I decided to fix these after the migration. You can manually tweak the file to add more redirects. I personally added the following to redirect all the old /year/ and /year/month/ urls to the root as well as catch requests for index.html. Note: The from regex is case sensitive. I've updated Blogger2Ghost.NET to generate redirects that are case insensitive (since Blogger is case insensitive). 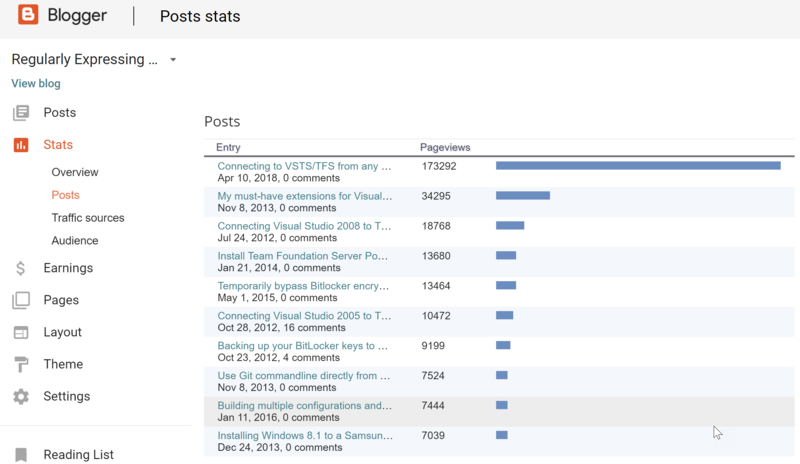 I finally clicked through the most visited pages of my blog (the Blogger Stats page comes in handy) and had to correct a few issues. if you've turned on Windows Spotlight you'll get a new lockscreen background every now and then. Some of these are just wonderful and you may want to set them as your wallpaper (like me).